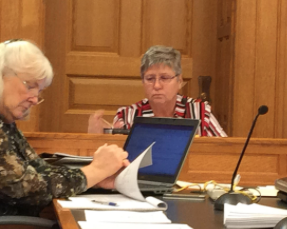 Rep. Brenda Landwehr, center, who chairs the House Social Services Budget Committee, acknowledges that there are substantial gaps in the Kansas mental health system but says lawmakers are virtually powerless to respond because of the depth of the state’s budget problems. Download the updated report from the Continuum of Care Task Force. Rep. Brenda Landwehr, who chairs the House Social Services Budget Committee, agreed there are substantial gaps in the system but said lawmakers are virtually powerless to respond because of the depth of the state’s budget problems. The state faces a projected $320 million deficit in the current budget year. Lawmakers must close that gap by the end of June to comply with a provision in the Kansas Constitution that prohibits deficit spending. Before adjourning, they also must cover a projected budget deficit of more than $800 million for the fiscal year that starts July 1. Given the amount of projected red ink, Landwehr said the state can’t afford to implement task force recommendations that would require significant new spending. Specifically, she said, it can’t afford to add psychiatric residential services for people covered by KanCare, the state’s privatized Medicaid program. A lack of supervised living arrangements for people who are too ill to live on their own but who don’t need to be in a hospital is one of the most critical gaps in the system, said Amy Campbell, a task force member who lobbies on behalf of the Kansas Mental Health Coalition. “If we are not going to create an opportunity for (supervised housing), we are going to continue spinning in the cycle,” Campbell said. When patients with serious mental illnesses are released from state psychiatric hospitals without adequate support, their symptoms can escalate quickly, forcing them back into the hospital, Campbell said. The updated report did credit the state for funding crisis centers in Kansas City, Wichita and Topeka that help divert patients from the state psychiatric hospitals. However, it said other decisions made in 2016 by Gov. Sam Brownback and members of his administration — such as cutting KanCare reimbursements by 4 percent and canceling contracts with state universities to train mental health workers — weakened the system. In the updated report, task force members also signaled their opposition to privatizing Osawatomie State Hospital, citing concerns about the quality of care delivered by for-profit contractors in other states. “Other states have seen privatized hospital beds decertified or worse; patients and employees harmed because privatization cannot resolve the problems of understaffing and underfunding,” the report said. The state’s proposal to privatize Osawatomie State Hospital called for a contractor to continue operating the hospital with reduced funds from the state and to provide new facilities while maintaining 206 inpatient beds. KDADS officials began pursuing privatization after federal officials cut Medicare payments to the hospital over concerns about patient safety. The report also called for the state to reopen 60 closed beds at Osawatomie State Hospital. The facility has been running at a reduced capacity since mid-2015, forcing people in crisis to wait in emergency rooms for an open bed, the report said. Landwehr, however, said she thinks the state should look into the advantages and pitfalls of privatizing or closing Osawatomie State Hospital. It might no longer be practical to maintain a state hospital in an aging facility, she said. Rep. Kathy Wolfe Moore, a Kansas City, Kan., Democrat, is among the task force members skeptical of privatization. A majority of House members agree. More than 60 have signed on to a bill that would prohibit the privatization of either of the state’s mental health hospitals unless authorized by the Legislature. Increase funding for community mental health programs that have shown results. Continue funding programs for people transitioning out of state hospitals. Increase the number of beds for substance abuse treatment. Small substance abuse programs are scattered throughout the state. Assist primary care practices with managing psychotropic medications or use telemedicine so psychiatrists can monitor patients remotely. Update rules to allow rehabilitation services in mental health nursing facilities.